There are so many incredible options when it comes to choosing the perfect rug for your space. Some of my favorite places to shop for carpets in New York are Donghia, Tai Ping or ABC Carpet. Prices can range dramatically so depending on your budget, you have to decide which route you want to go. Considering how many options there are, this overview will be the first of a series of rug stories at VT Home. See below for some helpful tips to consider when choosing a rug. It is important to decide whether you want a silk, wool, synthetic or a blend for your rug or carpet. A common misconception is that since silk carpets are more expensive, they are more delicate. In reality, they are actually more resilient and stain resistant than a synthetic carpet. If you have a family with small children or pets, or if you just don’t want to invest in an expensive rug, go with synthetic or a wool blend. It may not last as long, but there are some incredibly luxurious options. A return to wall-to-wall carpeting creates a quiet, intimate, and warm vibe—great for bedrooms. We have been fans of silk versions such as this one from Donghia. This incredibly chic patterned rug is the true statement piece in this subtle room by S. Gambrel. A Moroccan rug by Beni Ourain makes this bohemian home office extra homey. The bold yellow dresser seals the deal. Keeping in mind your décor and the direction you want to take a room in, consider the styles of rugs available. For example, do you want a classic Oriental design, a contemporary one, a neutral solid, or maybe even a sisal? A rug is a great opportunity to change the direction of, or define the mood of a room. I recently found a larger than necessary rug on clearance from ABC for a client with pets and had it cut and bound to a perfect large circle in order to break up the line of a living room in SoHo. Below are some helpful tips to help you understand different Oriental rugs. Chobi Ziegler rugs are a classic style of Oriental rug identified by their muted color scheme and classic soft designs. Persian rugs are Oriental rugs hand-woven in Iran (formerly Persia). Persian rugs were the original and most respected of Oriental rugs. They often feature classic motifs such as pomegranates, flowers, jugs, husks, combs, and lotuses and the color schemes are classic blue, red, brown, beige, and gold. Ikat designs are tribal inspired, with abstract, tie-dye like features. Ikat rugs have a unique dying and over-dying process that gives them more color variation and depth than other Oriental rugs. Modern rugs are contemporary styles and colors with traditional, hand-knotted quality. The appearance is in line with modern designs and styles, while the way these rugs are made is traditional. Thus, modern and vogue Oriental rugs have a very luxurious, natural texture and are of excellent quality. This fantastic flat in London is made sublime using the ‘blue trick’. 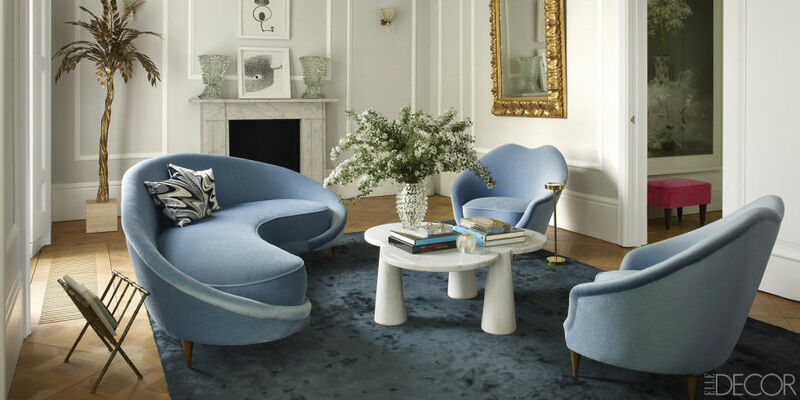 The chic blue rug and and the mohair upholstery make for a cozy and modern room. The carpet you choose can very easily define the room. Keep in mind that sometimes entire rooms are designed around the colors found in a really fabulous rug. This is a great place to start if you are wondering where to begin. You don’t have to have a classic oriental rug in a more traditional home—mix it up with a contemporary option. Remember the joy of eclecticism! An elegant arc deco inspired design allows this rug to make the biggest statement in this room. Fabulous french interior designer, Jean Louis Deniot used this wildly chic custom rug in complimentary tones that work magnificently with the fresh neutral palette. At first glance, this very sophisticated townhouse drawing room may appear simple. Take a closer look and notice the contemporary patterned rug that pulls together the eclectic collection of art and furniture.